جمهوری افغانستان ; پښتو: د افغانستان اسلامي جمهوريت, فارسي (دري): جمهوری اسلامی افغانستان) په غرونو کې کلابند يو هېواد دی چې د اسيا د لوې وچې په څلورلاره کې پروت دی. په ټولګړې توګه دا هېواد د منڅنۍ آسيا يوه برخه ده،‌ خو کله ناکله بيا په داسې سيمې څرګند شوی چې نه په منځني ختيځ او نه پر سوېلي اسيا پورې تړلې ده،‌ او دا پدې چې دغه سيمه د منځني ختيځ او سوېلي اسيا سره فرهڼيز، ژب توکميز او جغرافيکي اړيکې لري. دا هېواد په لوېديځ کې د ايران سره،‌ په سوېل او ختيځ کې د پاکستان سره،‌ په سهېل ختيځ کې د چين سره، په سهېل کې د تاجکستان، ازبکستان او ترکمنستان سره ګډې پولې لري. سرزمین افغانستان در طول تاریخ گلوگاه تهاجم به هند بوده‌است؛ جنگجویان بسیاری چون «اسکندر مقدونی»، «محمود غزنوی»، «تیمور گورکانی»، «نادر شاه افشار»، از پیچ و خم کوه‌ها و دره‌های این کشور خود را به هندوستان رسانده‌اند. علاوه بر این تا قبل از کشف راه‌های آبی در قرون جدید و سپس توسعهٔ راه‌های هوایی، خط مسیر بازرگانی شرق و غرب، از دشت شمال این کشور عبور می‌کرد که محل عبور کاروان‌های جادهٔ ابریشم از این سرزمین بوده که عموماً از طریق قندهار به هند و از طریق بلخ به چین می‌رفت. پس از کشف راه‌های آبی و سپس توسعهٔ راه‌های هوایی، افغانستان مانند سایر سرزمین‌های آسیای مرکزی، تبدیل به منطقه‌ای محصور شد. The Islamic Republic of Afghanistan is a landlocked country located at the heart of Asia. Generally considered part of Southern Asia, it is sometimes ascribed to a regional bloc in either Central Asia or the Middle East, as it has religious, ethno-linguistic, and geographic links with most of its neighbours. It is largely bordered by ► Pakistan in the south and east, ► Iran in the west, ► Turkmenistan, ► Uzbekistan and ► Tajikistan (with ► Gorno-Badakhshan) in the north, and the ► People's Republic of China (► Xinjiang) in the far northeast. More images Afghanistan - Afghanistan (Category). This section holds a short summary of the history of the area of present-day Afghanistan, illustrated with maps, including historical maps of former countries and empires that included present-day Afghanistan. Present-day Afghanistan is around 1500 and 800 BC part of Ariana. Ariana is conquered by Persia in the sixth century BC. 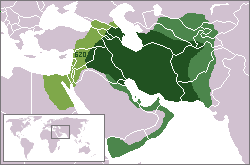 This map shows the Achaemenid Empire (Persia (648–330 BCE) at its greatest extent. Ariana becomes a satrapy of the Achaemenid Empire. Invasions by the Scythians, White Huns and Turkic tribes follow in succeeding centuries. Mentionable is the rule since the first century by the Kushanas, a buddhist people. The rule of the Caliphate is replaced by a temporary Persian rule until the area is conquered by the Turkic Ghaznavids in 998. Ghazni is turned into a great cultural center as well as a base for frequent forays into India. Following Genghis Khan's death in 1227, a succession of chiefs and princes struggle for supremacy until late in the 14th century, when one of his descendants, Tamerlane, incorporates Afghanistan into his own vast Asian empire. Babur, a descendant of Tamerlane and the founder of India's Mogul dynasty at the beginning of the 16th century, makes Kabul the capital of an Afghan principality. In 1747 Afghanistan liberates itself from the Empire of the Great Mogul. The State of Afghanistan is formed and Ahmad Shah Durrani establishes his rule. Throughout his reign, Durrani consolidates chieftainships, petty principalities and fragmented provinces into one country. His rule extends from Mashad in the west to Kashmir and Delhi in the east, and from the Amu Darya (Oxus) River in the north to the Arabian Sea in the south. From time to time separate Afghan states are installed in Kandahar and Herat. Though the country is united sincethen, it has to accept after the second Anglo-Afghan war (1878-80), that brings Amir Abdur Rahman to the throne, a British protectorate in 1881. The British retain effective control over Kabul's foreign affairs. After the third Anglo-Afghan war in 1919, Britain relinquishes its control over Afghan foreign affairs by signing the Treaty of Rawalpindi. This means full independence of Afghanistan and the establishment of a more or less constitutional monarchy. King Amanullah (1919-29) renames the country Kingdom of Afghanistan in 1926 and introduces modernization and secularization. This leads to his assassination and a short civil war. In 1929 Nadir Shah becomes king. Four years later, however, he is assassinated in a revenge killing by a Kabul student. In 1933 Mohammed Zahir Shah becomes king. He introduces in 1964 a liberal constitution providing for a two-chamber legislature to which the king appointed one-third of the deputies. The people elected another third, and the remainder were selected indirectly by provincial assemblies. He permits a multi-party system. This leads to the formation of the communist Hizb-i-Democratic-i-Khalq (People's Democratic Party, HDK), which had close ideological ties to the Soviet Union. In 1967, the PDPA split into two major rival factions: the Khalq (Masses) faction headed by Noo Mohammad Taraki and Hafizullah Amin and supported by elements within the military, and the Parcham (Banner) faction led by Babrak Karmal. After a coup d'état in 1973 Afghanistan becomes a dictatorial republic and is renamed Republic of Afghanistan. Mohammed Daoud Khan, until that moment prime minister, becomes president. In 1978 the HDK seizes power and a communist dictatorship is established under the HDK, lead by Noor Mohammed Tarraki (1978-1979). The country is renamed Democratic Republic of Afghanistan. When Taraki is assasinated in 1979 he is succeeded by Hafizullah Amin (1979). At that moment the USSR invades the country and installs after the assasination of Amin Babrak Karmal as new president. Islamic factions start a guerilla war against the regime and the soviet-occupation. In an attempt to moderate Afghanistan is renamed into Republic of Afghanistan in 1987. Karmal is replaced by Mohammed Najibullah in 1986. In 1990 the Islamic mujaheddin (Holy Warriors) expel the communist dictatorship. Though a central government is installed, de facto the country is ruled by warlords. In 1992 the central government renames the country into the Islamic State of Afghanistan. Burhanuddin Rabbani becomes president. The civil war continues and in 1996 the Taleban movement of spiritual leader Mullah Mohammad Omar seizes power in most of the country. Afghanistan becomes a theocratic dictatorship and is renamed Islamic Emirate of Afghanistan. Mullah Mohammad Rabbani is appointed president. After an invasion by the United States in 2001, followed by a popular uprising, the dictatorship collapses. Afghanistan gets a transition governement and is renamed Islamic State of Afghanistan. Burhanuddin Rabbani resumes office, but the same year he is succeeded by Hamid Karzai. In 2004 a new constitution is accepted, identifying Afghanistan as an "Islamic Republic." The constitution paves the way for nationwide presidential and parliamentary elections to be held in june 2004. The government's authority beyond the capital, Kabul, is slowly growing, although its ability to deliver necessary social services remains largely dependent on funds from the international donor community. ↑ Romanization: Afġānistān - Da Afġānistān Islāmī Jomhoriya. ↑ Romanization: Afġānistān - Jumhūrī-yi Islāmī-yi Afġānistān. This page was last edited on 4 March 2016, at 10:27.